Our master craftsmen hand built these contemporary glass panel double doors from solid, naturally air dried, full length, American timber. The thick, double pane glass panels provide for maximum security and energy efficiency. Finally, as shown the fine art quality, custom contemporary door handles put the finishing touches on a modern looking door built with old world materials and craftsmanship. All of our custom doors are available with any handles, pulls, or hardware of your choice. Like all of our custom doors, the wood frame of these contemporary glass panel double doors has been finished with a hand applied finish. We offer hundreds of choices of wood finish colors, or can match to the color of your choice. These finishes are a hand rubbed, multi-step process that blends the finish into the grain of the wood. What this means is that your finish will never fade, crack, or chip like painted on finishes. In addition, these doors are certified as fine art quality by world renowned artist H.J. Nick. Every product that leaves our shop is stamped with the H.J. Nick seal to ensure that is is an investment quality piece with future antiquity value. Never settle for the rest, when you can have the best, only at ArtFactory.com. 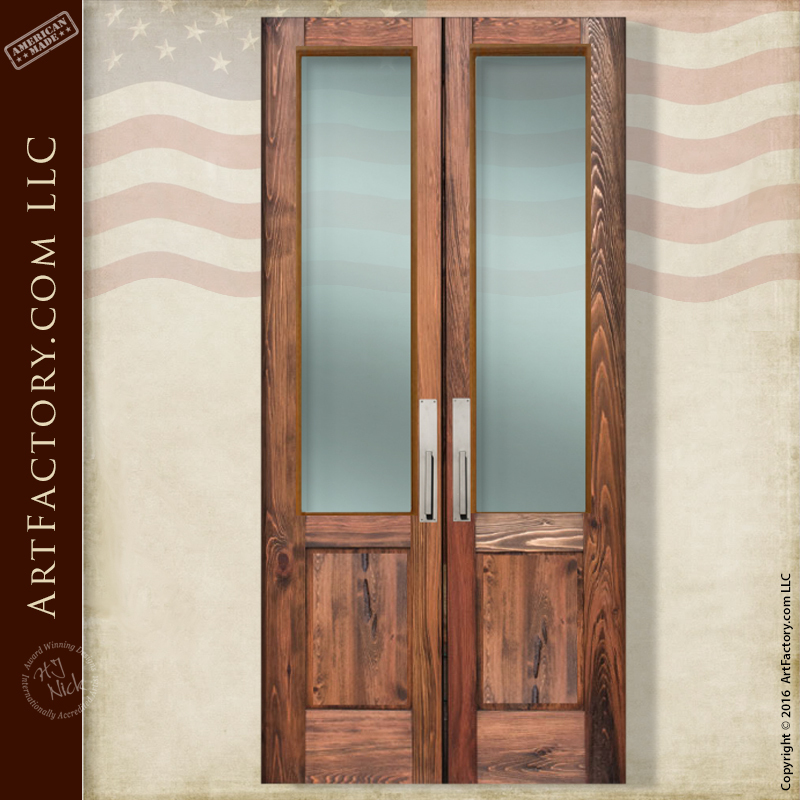 Handcrafted fine art doors, gates, home furnishings and more, made in the USA since 1913. We can also make any of our custom door designs as custom gates or custom garage doors. Make a proper first impression that reflects your personality and accomplishments in the same way kings, queens, and other aristocracy have done for thousands of years. Request a quote for your dream doors today. We hand make interior and exterior doors in any style, limited only by your imagination! All, virtually maintenance free doors that more than surpass all hurricane codes. Our contemporary glass panel double doors will provide maximum security that will last forever. Contact us to discuss your designer door ideas at 1-800-292-0008. Were so confident in our fine craftsmanship and the durability of our products that, as a result, we guarantee everything forever.